This 1998 Maxum 2800 SCR is fully loaded with every amenity, and repowered by Mercruiser certified technicians in June of 2010 with a remanufactured 7.4L MPI fuel injection longblock from Mercruiser with new water pump, new circ pump, new pulleys, new Mercathode system, new thermostat, new distributor, new belts and hoses and new risers and manifolds. The outdrive is a Mercruiser Bravo III with duoprop for easy steering and great acceleration. The boat is a great liveaboard/cruiser, and has shore power, air conditioning, a Kohler generator, powered anchor windlass, stand up head with holding tank and shower and sink, galley with stovetop range and sink, refrigerator, microwave, coffe maker, fire extinguisher, flat screen TV, hot water heater, battery charger, dual batteries, nice upholstery and cushions, Garmin GPS 182C chartplotter/ depthfinder, JVC CD player and radio, VHF radio, searchlight mounted on radar arch, transom hot and cold swim shower, swim platform with ladder, large forward V berth and aft berth. bimini, and sitting tables in cabin and cockipt. 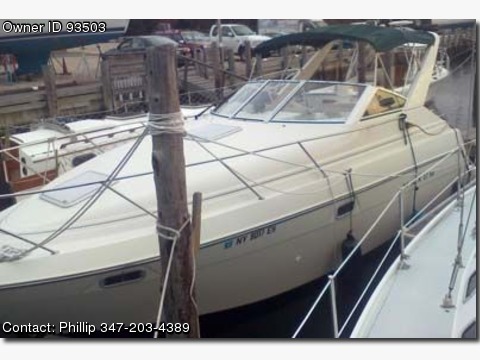 Perfect for entertaining and cruising, and very clean inside and out. Comes with docklines and fenders. air conditioning, head (enclosed), refrigerator, shower, water (fresh), vhf/radio, fathometer, loran/gps, compass, generator, 110v power, Boat is on land, under shrink wrap, and available for viewing in East Hampton, NY, 11937.